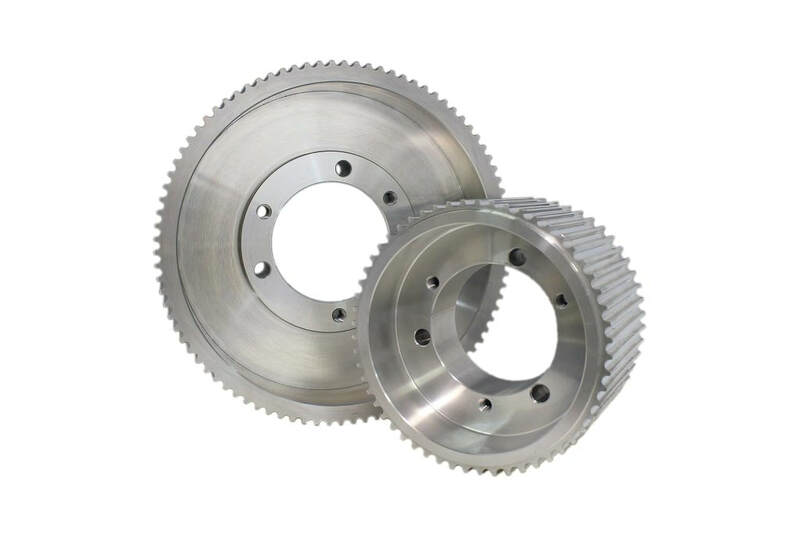 For custom, high quality, precision timing belt pulleys, HM Manufacturing provides made-to-order prototypes, high volume production runs and assemblies for timing belt pulleys to each customer's specifications. HM Manufacturing is a state of the art manufacturing facility complete with CNC turning, hobbing, milling, and broaching services. HM’s custom timing belt pulleys are offered from a variety of materials, including; stainless steel, aluminum, steel, and plastic and range in size from 1/2”-24” in diameter. 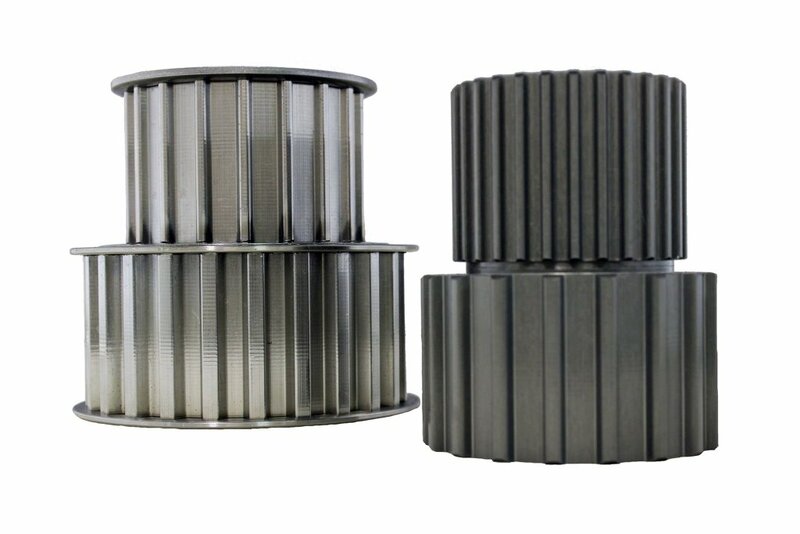 HM Manufacturing has experience in a variety of custom timing belt pulley applications and is known for providing customers with value- added solutions for industry demand. Imperial pitch pulleys have pitch designations based in inches, and also have a trapezoidal tooth form. 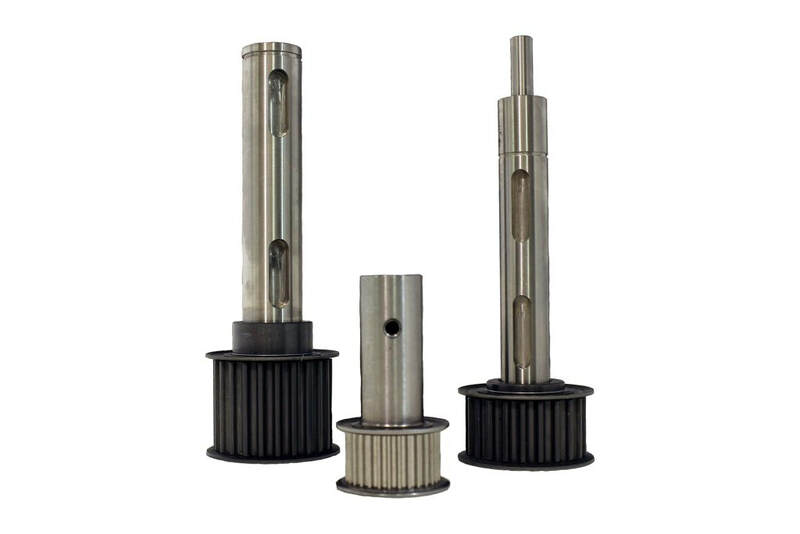 Our imperial pitch pulleys MXL, XL and L are made for light load applications, while H, XH and XXH imperial pitch pulleys are made for heavy duty applications. Powerhouse™ HTD: 3mm, 5mm, 8mm, and 14mm (compatible with HTD) Powerhouse™ HTD are curvilinear sprockets designed for efficiency and effectiveness. These drives are also designed to handle a wide range of belt speeds, generate virtually no friction and are able to handle heavy applications. These can be produced and are compatible with plain bores, metric minimum plain bores, QD® bushings, or Taper-Lock bushings. Power-Grip™: 2mm, 3mm, 5mm, 8mm, and 14mm (compatible with Power Grip GT2 and GT3) The PowerGrip GT2 System, features modified curvilinear belt tooth profile and provides superior timing and accuracy. PowerGrip GT2 Belts have a higher capacity and longer belt life than trapezoidal belts. 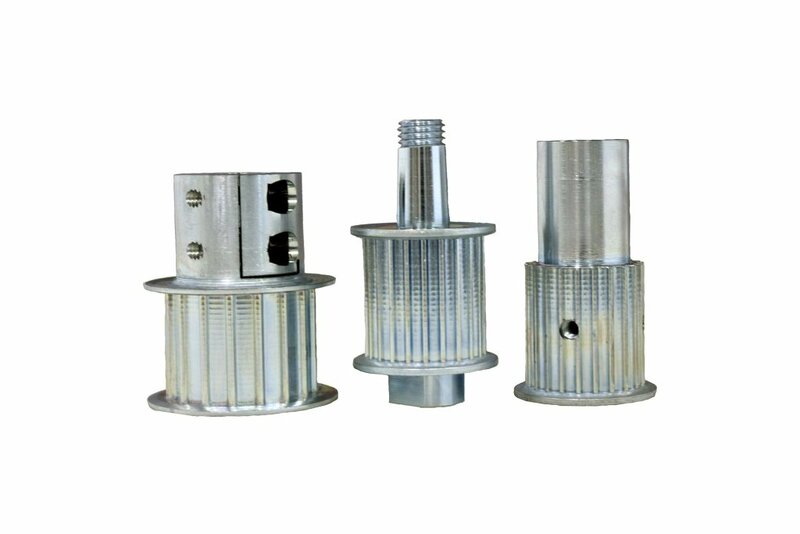 These pulleys are precision manufactured and static balanced to eliminate wobble. Poly Chain™: 5mm, 8mm, and 14mm (compatible with Gates Poly Chain GT2, TB Woods QT Power Chain II, Goodyear Falcon HTC, S.I.T. GTR Falcon, Dodge HT-500, and Martin MPC) Poly Chain™ have a precise sprocket design that produces positive, press fit to shaft. 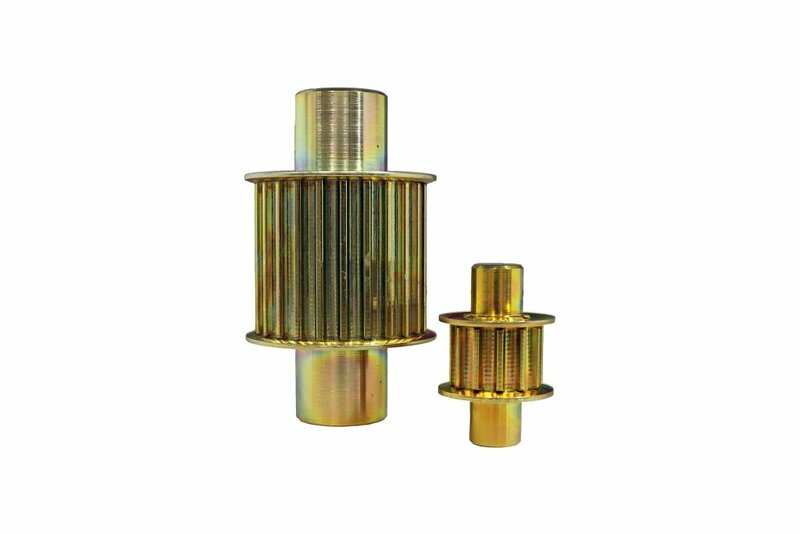 Smaller, narrower pulleys save shaft space, keep the load closer to the bearing and extend life of reducer. These timing belt pulleys are precision manufactured and static balanced. Super Torque: S2M, S3M, S5M, S8M, and S14M Modified curvilinear Super torque belts allow for longer operating life while smooth meshing allows noiseless operation. It is possible to transmit high torque power with a small belt. Parabolic belts allow for Improved belt life due to less tension decay and are jump and shear resistant. Reduced pulley wear as well as shock absorbing allow for smooth and quiet operation. T2.5, T5, T10, and T20 (available in reduced backlash and zero backlash) AT3, AT5, AT10, and AT20 (available in reduced backlash and zero backlash) Metric timing belt pulleys come in trapezoidal form. 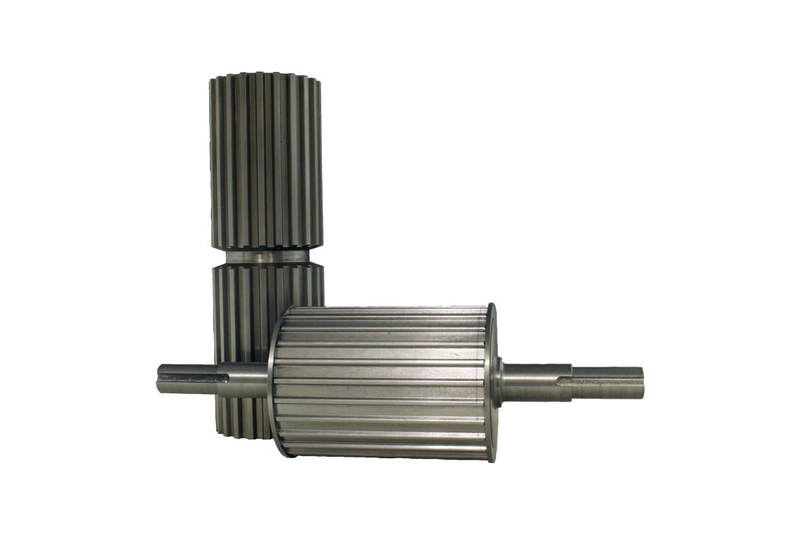 These pitch pulleys can come in a various, pitch and outside diameters, overall length and individual specifications. The small pitch sizes are ideal for light power applications and accurate positioning.